It has been about 4 months since the last installment of Project Diva series entitled 'Project Diva f'' was released for the handheld PS Vita. And as SEGA informed they will be also releasing a PS3 version in the year 2013. A date has been set up for its release to be on March 7 in Japan. Read more to find out what can we find in this new addition. 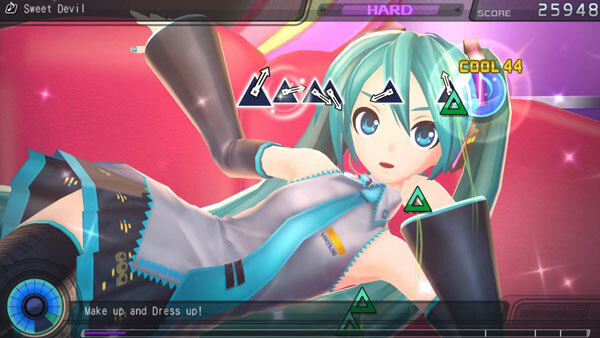 Also the title has been changed into 'Project Diva F'. Yes, with a capital 'F' instead of 'f'. UPDATE: Added news about PO bonus, game updated description and a video. UPDATE: Included final box art for the game. Source SG Cafe. Some of you might be wondering, that the choice of date is just two days away from the symbolic date 'March 9', which is also correlate to the 39's Giving Day or simply a play of word between the numbers in Japanese, pronounced into 'Mi.Ku'. So why not just make the release date on March 9? Apparently, according to SG Cafe, it has something to do with Japan rule with release date of every games must come Thursday, which in this case falls on March 7. Welp, their place their rules eh? Compatibility with Vita's system data and edit song data. Not sure if its mean the DLC of Vita can be played on PS3 though. The start-shaped notes shall stay in the gameplay, but a different mechanics will be introduced to replace the scratching methods from PSV. Apparently you used the analog to play that mode. Speaking of new songs, Famitsu has revealed confirmation of two new but familiar songs for the PS3 edition. 'Tell Your World' by kz livetunes and 'Sweet Devil' by HachiojiP has been confirmed to be included in the upcoming release. Two new modules, possibly for the song also has been showed. There is also a possibility of the song 'Senbonzakura' hinted to be included in the game as well. The silhouette of a familiar module. Could it be??? If your PO now, you can get a Pre-Order bonus which is a cute rubber strap of Miku. At least for now, its seems only AmiAmi and CDJapan provide the bonus item, with AmiAmi with its own exclusive item. A video by SEGA has been released in Youtube, promoting the game and giving its audience of whats the new game would be like.